A few days ago, after a beautiful morning’s tramp, I arrived at a new and spacious Department of Conservation hut. Since there were no good campsites down the trail for some distance, I decided to call it an early day and settle in. The hut had a large deck that looked out onto a beautiful river valley, and as I was going through the ritual of unpacking and signing the Intentions book, I heard footsteps out front and soon a man entered. I could tell immediately he was an experienced hiker as he was traveling light and also went about his unpacking methodically. We began a conversation and soon it was clear to me that he was also a real gear-head. I wondered to myself how long it would be before he told me how many grams his stove weighed (answer: half hour). This is not to say that I am uninterested in equipment. It is very much part of the long distance hiking experience and good equipment can make a trek much more enjoyable (see my earlier post “Inventory”). Rather, gear is really not much of a topic for conversation, particularly when it becomes a competition measured in grams. However, that encounter did get me thinking about deliberation–how it functions in our sense of being, our sense of living. One of Thoreau’s most quoted phrases is his explanation for his time at Walden pond: “I went to the woods because I wished to live deliberately”. The rest of the sentence reads, “to front only the essential facts of life, and see if I could not learn what it had to teach, and not, when I came to die, discover that I had not lived.” Two things are clear about this sentence: Thoreau is concerned with a life (perhaps a topic for another pointless essay), and that living deliberately is part of that concern. I have always been intrigued with how adverbs, even when clearly linked to a particular action in a sentence, tend to float above all, somehow modifying or at least Inflecting the entire utterance and often creating interesting tensions and ambiguities. I suppose it is easy to ascribe attributes to objects, but actions are slippery. Without doubt Thoreau thematizes living deliberately in this sentence, but his decision tends to also get folded into the modification. Going to the woods was a deliberate choice and it is in many ways the subject of the his book, his justification for rustication. Care is a concept often associated with deliberation. A jury will (one hopes) carefully deliberate the fate of the defendant. To be deliberate is to proceed with forethought, taking account of the multiple implications of any given action. In other words, to be deliberate is to be careful. Indeed, to be carefully careful. But I want to understand where those two terms diverge, and in that gap, reflect on different modes of walking. Thoreau may have gone to the woods to live deliberately and often he does, but just as often another, non-deliberative form of life comes into play, one that can be understood by a brief excursion into the work of another philosopher who went to the woods, to a small house near Todtnauberg, also to live and write deliberately–Martin Heidegger. It is appropriate that as I write this, I find myself also deliberately in the wilds. In my case, severe weather has driven me off the Te Araroa and into Comyns Hut on the South Island about 15 km south of the Rakaia River. Comyns is an odd, old hut, completely made of steel– corrugated steel siding attached to a structural steel frame, all of which rocks and rolls In the wind (even the door is flapping steel). There are plenty of holes for the wind and rain to enter and no firewood for warmth or to dry my wet clothes. After a morning spent fording streams in gale-force winds and driving rain, I need to think about care as well as my own deliberateness. Toward the end of Division 1 of Being and Time, Heidegger is offers the ground for Dasein, for the question of Being: “Care, as a primary structural totality, lies ‘before’ every factical ‘attitude’ and ‘situation’ of Dasein, and it does so existentially a priori; this means that it always lies in them. So this phenomenon by no means expresses a priority of the ‘practical’ attitude over the theoretical. When we ascertain something as present-to-hand by merely beholding it, this activity has the character of care just as much as a ‘political action’ or taking a rest and enjoying oneself. ‘Theory’ and ‘practice’ are possibilities of being for an entity whose being must be defined as ‘care. '” Being, in all its possible modes (including both the practical and the theoretical, the ready-to-hand and the present-to-hand) is primordially grounded in care. Up to this point, this does not seem too distant from Thoreau’s ‘deliberately.’ Both imply life of mindful consideration. One must proceed deliberately and with care. But the distinction Heidegger makes above between the practical and the theoretical, and his invocation of the notion of present-to-hand complicate the picture. A way to unravel this a bit is to go to the woods with both of them and also out walking the trail. The heart of Heidegger’s critique of Western philosophy is that it is fairly well-equipped to deal with the present-to-hand but woefully lacking in resources to comprehend the ready-to-hand, which, by the way, is where all the action is. One could say the present-to-hand is adjectival, while the ready-to-hand is adverbial, and we all know how ambiguous but at the same time vital all those adverbs are. Heidegger is quick to point out that the ready-to-hand is not just using a tool: “The ready-to-hand is not grasped theoretically at all, nor is it itself the sort of thing that circumspection takes proximally as a circumspective theme. The peculiarity of what is proximally ready-to-hand is that, in its readiness-to-hand, it must, as it were, withdraw … in order to be ready-to-hand quite authentically. That with which our everyday dealings proximally dwell with not the tools themselves …. On the contrary, that with which we concern ourselves primarily is the work — that which is to be produced at the time; and this is accordingly ready-to-hand too. The work bears with it that referential totality within which the equipment is gathered.” The ready-to-hand “withdraws” not to some mysterious other world but rather withdraws from any understanding as present-to-hand. A hammer used fluently is transparent. A hiker’s trekking poles (discussed below) are transparent extensions of arms, at least until a compression joint slips and one is suddenly shorter than the other. There is always more to the ready-to-hand than the objective description because it is always already part of a larger functioning whole that is part of a humming, buzzing background of human/nonhuman activity. On the one hand a banal jingle, but on the other, a direct and sincere questioning not so much about the sources of knowledge, but what counts as knowledge. All anybody might know is the wind that blows, as the rest of knowledge that is produced by the arts and sciences (and presumably the appliances of technology) remains abstract or ephemeral. In a sense, what he is pressing in these questions is how can we know the entities experienced through the ready-to-hand. As Heidegger argues in Being and Time, concernful absorption has its being in the function of “discovering” and fundamental to this process is that “those entities within-the-world which are brought along [beigebrachte] in the work . . . . The kind of being which belongs to these entities is readiness-to-hand.” In the process of building his house, Thoreau also encountered Heidegger’s notorious broken tool as he broke the borrowed axe handle and had to replace it himself, an action that give some insight into the local nature of equipmentality. 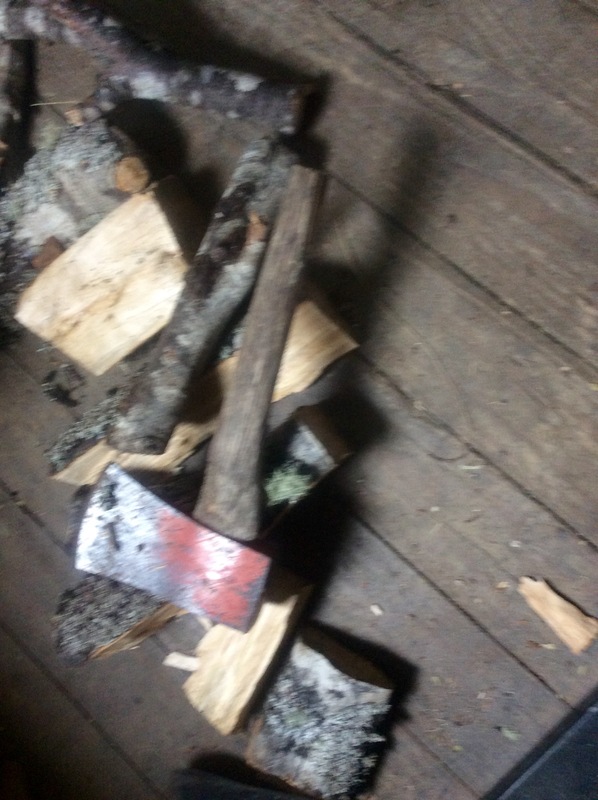 If the axe’s owner was a tool proficient, he or she would likely not appreciate the returned axe even it it was exceptionally sharp (as Thoreau claimed) because hanging the axe head was, in the nineteenth century, a highly personalized process. In addition, no one would soak an axe with its handle in the pond to tighten the fit as the moment it dried back out, everyone would be dodging a flying axe head. Probably taking a cue from Dewey, Francisco Varela makes a distinction between ethical “know-how” and ethical “know-what” that can illuminate this distinction I am trying to draw between care and deliberation. When confronted with breakdown, a specific problem that must be decided on the basis of the good, we deliberate. There we know we are in the presence of the ethical and, one hopes, exercise all our deliberative capacities to make a good decision. But there are countless everyday gestures that do not rise to the level of the clearly ethical, that do not invite us to exercise our ethical know-what, but still form part of a life that tends toward the good. When walking through a door at a crowded building entrance, you may hold the door open as you pass just a moment longer to enable those behind you to follow. Hardly an “ethical” act, but one that is part of a habitual pattern of behavior that can be described as care. It is a proceeding with care by recognizing that Dasein is already being-in-the-world so that it includes the world in all its equipmentality. From that perspective, Being opens out onto a future through an authentic relationship to the world articulated as care. Such care extends not just to people but also to equipmentality broadly construed, which finally brings me back to the gear-head who prompted this reverie and an example that in its triviality I hope demonstrates the point. As it turns out, we both have the same brand and style of tent which requires the use of trekking poles as it does not have traditional tent poles. 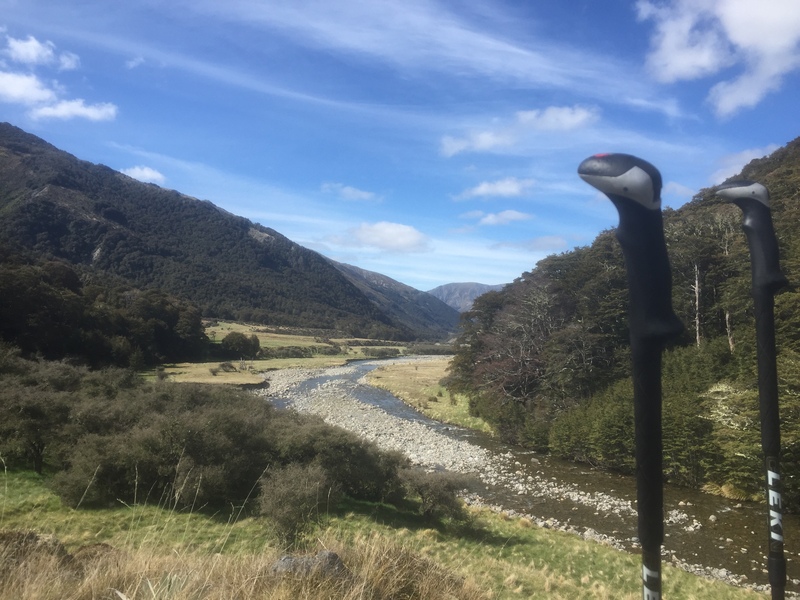 Trekking poles are an important part of my hiking equipment as they enable steep ascents and descents (particularly with old and infirm knees), enable me to off-load some of the strain on my legs to my arms, and serve to guide me through boggy terrain. They are the perfect example of tools ready-to-hand. I am particularly hard on trekking poles and I am pleased with my current pair– carbon fiber Lekis (please don’t ask how many grams they weigh). When I set up my tent, I first adjust the length of each and usually I find myself holding both and looking down on my already stretched-out tent. The shorter pole needs to go to the back so I end up tossing it across the tent to the other side where it makes a sprongy sound on hitting the ground. I always flinch even though there is no way tossing it five feet will cause damage. Nevertheless, the sound is one of uncaring. I know, in a world of untold human misery, concern about the well-being of a trekking pole is absurd if not reprehensible. But, if care is the central instance of being, and equipmentality signals both the point of access to ready-to-hand understanding and a recognition of the interrelated human and non/human complexity of equipmentality, then care even on the level of hiking triviality is at least as important as life lived deliberately. We all experience the things of the world through use. For Heidegger, using an tool creates a primordial relationship that exceeds simple observation or hypothetical activity. For him, learning by doing is actually knowing by using. Such activity brings us closer to the equipmental whole the tool participates in. Such participation is the everydayness of being in the world, and brings with it the past present and future opening out of care. I can deliberate at length the details of my hike, and I can choose my equipment deliberately, but walking which is a primary mode of being is all about care. I packed as quietly as I could, remembering that Jan from the Czech Republic likes to sleep later than most thru hikers. 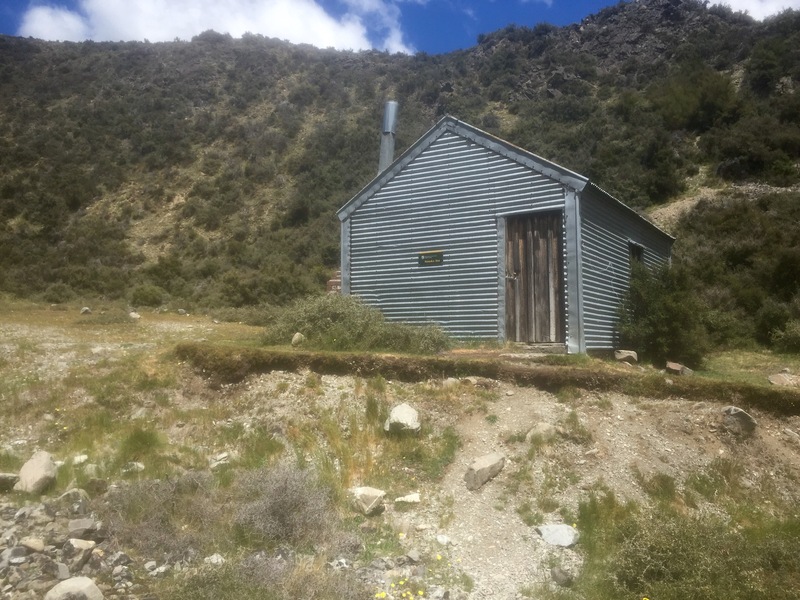 The trail led out over the hill directly behind the hut to the north branch of Ashburton River which was rushing knee deep and very cold. At least today the sun was shining (when I wasn’t in the shadow of the mountain), but the trail crisis-crossed the river all morning. My toes were numb, and walking felt like I had boards strapped to my feet. Later the trail turned off onto Round Hill Creek which I still had to ford often, but at least it was smaller. Making things even more difficult were the bushes that crowded the bank– they had inch long thorns that made hiking through them impossible. At one time, much of the path probably went through that area, but now it is too overgrown to even try. Still, late morning I sat by the creek, filled my water bottle and just sat there looking at where I was, wondering where I would be a year from now, and completely reveling in the moment. The rest of the morning to early afternoon was spent stumbling along unformed paths, over thick clumps of grass that hid the holes where the streams ran beneath, and there were very happy and healthy clumps of spear grass — what seems a species of yucca that pierces pants and skin. After an up and over a saddle, followed by several scree crossings, I found myself in a completely different landscape (though it still populated by the same difficult plants). The world opened into big flat dessert-like valleys with lakes off in the distance. When I arrived at Manuka Hut, even though it was early, I decided to call it a day. The morning’s pathless hike, coupled with strong wind had pretty well worn me out, and there were no huts or camping opportunities for the next 10 + km. 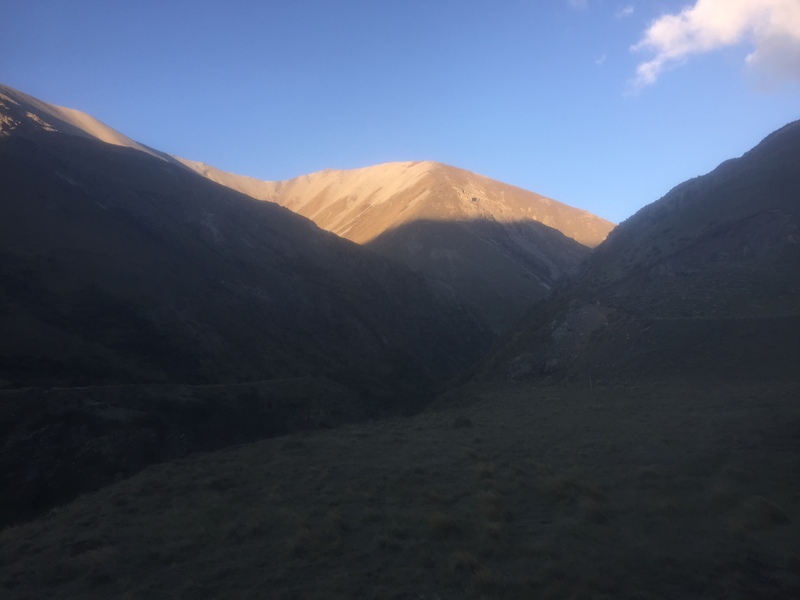 I hope a good night’s sleep will set me up for the big push to the end tomorrow which will also involve trying to hitch a ride down off the mountain and around the next big treacherous river–the Rangitata. Today I saw the truth of the old adage “red sky in morning, sailors take warning.” I woke at 5:00 and saw out the window a magnificent and ominous red sky accompanied by strong winds. Had coffee with another of the Blue Pub guests–a truck driver regarding the winds with some concern. It was still Thanksgiving back in States, so with the help of some free street-side Spark wifi, I was able to FaceTime briefly with the family who were in NYC. I hated to miss Thanksgiving, my favorite holiday, but the trail (and the bus I was to catch to get to the trail) beckoned, and after picking up a meat pie at the Four Square, we were off up a windy and windy road. Had great conversation with the driver who had spent time in the US. At the trailhead the wind was very powerful, and there were some sprinkles, but also much blue sky and the Methven weather had just called for some morning showers, so off I went. 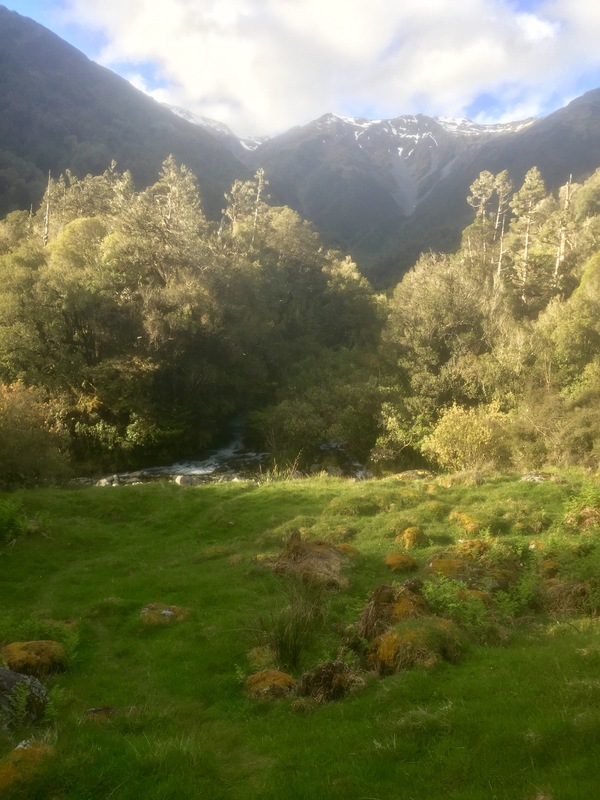 The first part was up through some pastures, and I felt at first as if I were back on the North Island except soon the landscape changed dramatically. The steep hills were basically treeless and covered with brown grass. At erosion points, the hills showed their foundations– basically they were huge piles of gravel covered with a thin layer of soil. Still, the trail was well-formed and I made good time the first 10 km to the A-frame hut. By the time I got there, the rain was really starting to come down and I should have gotten out all my heavy weather gear, but after a brief stop I decided to head on to the next hut–Comyns– which was only 6 km away. While in the A-frame I recognized the pack and gear belonging to Jan from the Czech Republic. 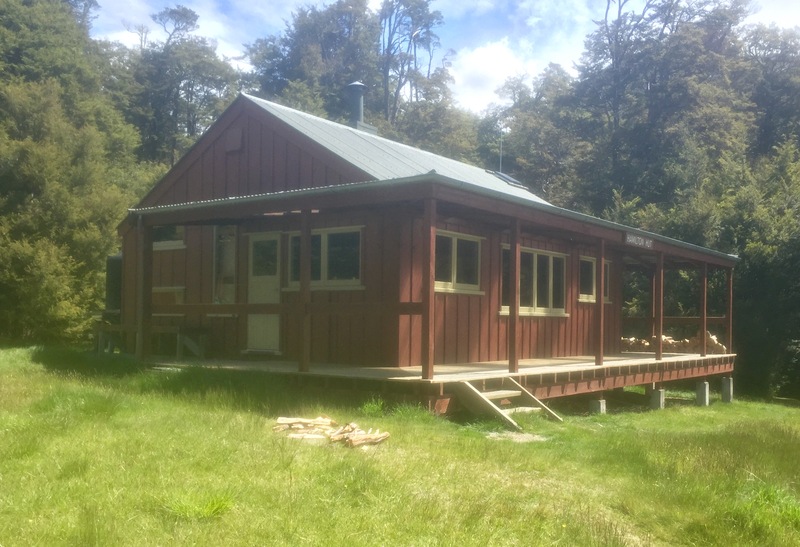 We had been in a hut together on the north island above Taumaranui and I had been a few days behind him for some weeks now. I didn’t see Jan until after I left and had reached the ridge above the hut. He appeared, walking back and we exchanged waves. In retrospect, I probably should have stayed there as the wind was soon strong enough to make me stagger, and the rain became intense and horizontal. I was only wearing light gear and had some concern about heat loss in those conditions, particularly since I had a number of wet stream crossings. But the trail was good and the wind usually at my back, so I covered the 6 km to Comyns in a little over an hour, arriving very wet and cold. 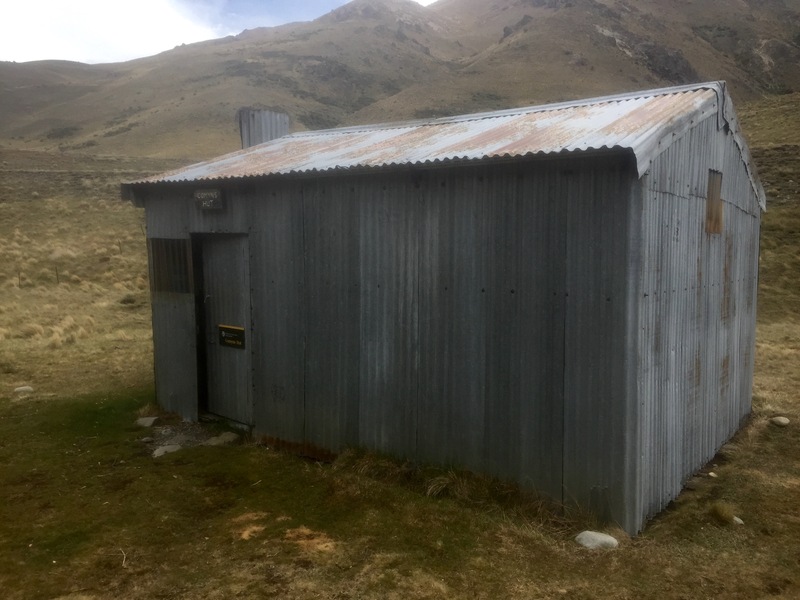 Comyns is an odd old hut, completely made of steel– corrugated steel siding attached to a structural steel frame, all of which rocks and rolls In the wind (even the door is steel). There were plenty of holes for the wind and rain to enter and no firewood for warmth or to dry clothes. Shivering, I peeled off wet layers and put on dry, made soup for lunch, hung my clothes to drip, and crawled into a sleeping bag for warmth, remembering that just yesterday afternoon I was sitting in the sun at the Blue Pub sipping a cold beer, and that back home people were sitting down to a meal that was likely much more than ramen noodles. But no self pity here, I’m still on an amazing trek seeing incredible beauty at every turn. A hard cold wet day is just part of that brutal beauty. Today was one of those dilemma days the Te Aroroa sometimes throws at you. From Hamilton Hut, there is a campground at about 15 km distance. The next accommodation is the Lake Coleridge Lodge, an upscale place that really wants early booking (and it is 47 km away). After that initial 15 km, all the walking is on a road, and there is no place to freedom camp as it is all fenced farmland. 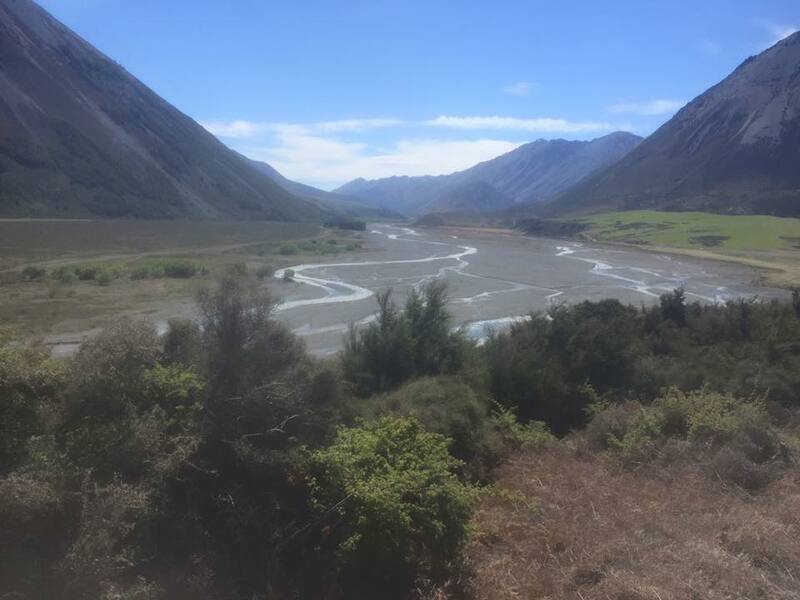 And to confound matters even more, the reason for going to Lake Coleridge Village to start with is that there is where you are supposed to ford the Rakaia River, except now the TA discourages that route, asking hikers to go around via the road at Rakaia Gorge. My solution to all this was to hike out hard this morning from the hut. It was a brisk and windy day, and the trail down Harper River was a 4 wheel drive track that crossed the river constantly. So I spent the morning with wet feet, wading through some cold snow-melt water. I got to the road late morning and kept pushing until I had done about 30 km. Then a man from Christchurch who works with farmers on livestock ID offered me a ride. 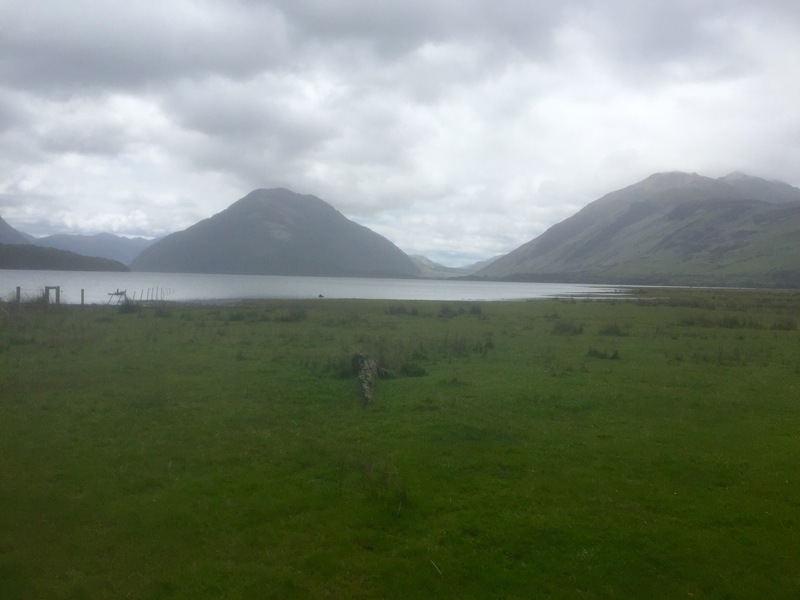 It was then I decided to go to Methven instead of Lake Coleridge Village. From here, I have been able to resupply and arrange early morning transportation back to the trail head on the south side of the river. I missed seeing Lake Coleridge village, but ended up with a much more reasoned approach to crossing the Rakaia. Last night’s Bangers and Mash did not agree with me, so my night was not particularly restful. Started the morning slowly as I wanted to get Eggs Benedict at the cafe before leaving (they are really really good– with us hikers, it’s all about the food). It was still overcast and sprinkling, so I checked at the DoC about how flooded the Harper River would be. They had no real information, but as it turned out, south of Arthur’s Pass the sun came out, so I decided to just hike to Hamilton Hut. If there is no more rain, the river should be down much further tomorrow when I get near the deep part. Fingers crossed. Outside the DoC, I caught a ride with Kelsey, a woman from Walnut Creek California, who was taking a couple day hike and ended up at the same hut. I definitely didn’t have any legs for hiking, so called it early, not trying for any further kms. On the way up the side of Mount Bruce, I could see all across the valley and the Alpine Scenic Train, which really did look, at that distance, like a model train. Definitely will try to sleep well tonight. Still pouring rain which makes the next part of the Te Araroa impassable (and I’m glad I got through yesterday as it would have been impossible today). So I’m spending the day here — a nice village to rest a bit waiting for slightly better weather. Will re-commence my hike tomorrow on the trail to Lake Coleridge. There is a bridge across the river there. It rained off and on most of the night and was raining when I left Hurunui Hut. 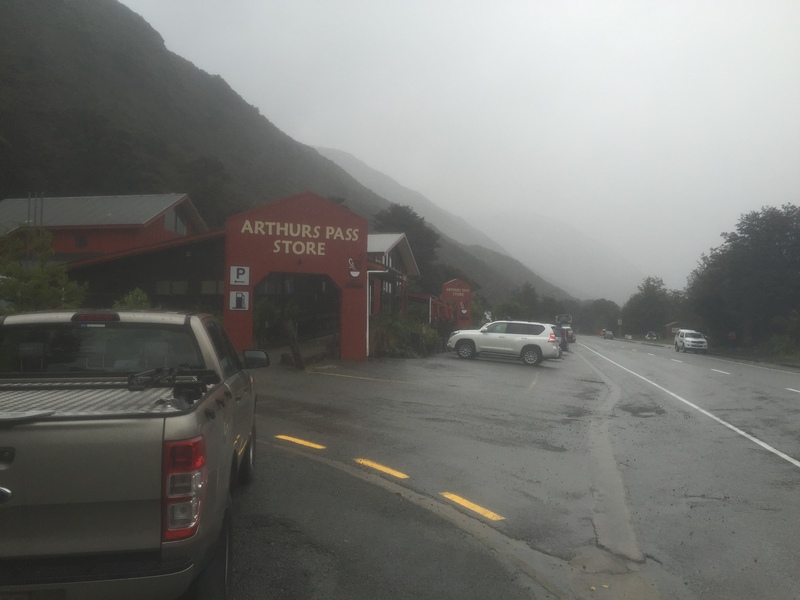 I hoped to at least get to Kiwi Hut if not out to the road to Arthur’s Pass, but high water is high water. 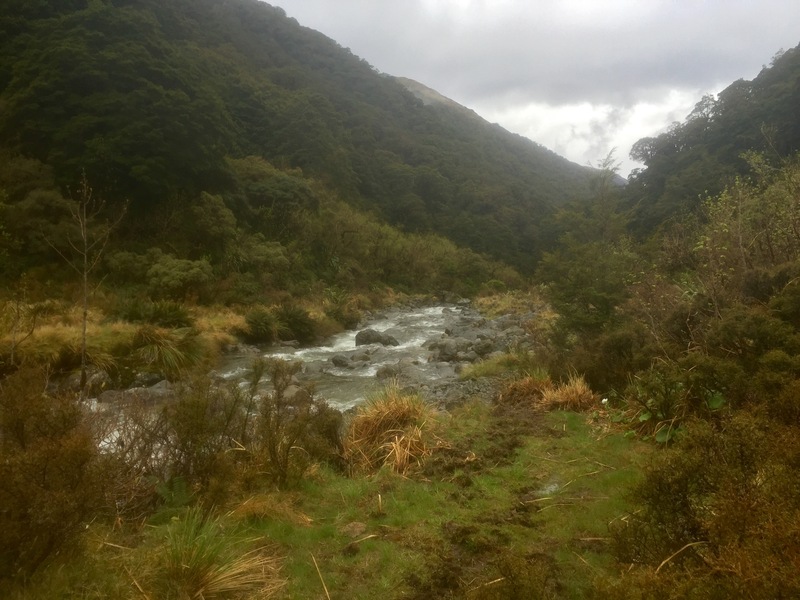 I was able to get to Locke Stream Hut– a difficult and at times very technical hike–because the first half was upstream toward the headwaters of the Hurunui and the second was down off Harper’s Pass along the headwaters of the Taramakau. It was only below the Locke Stream that the river became impassible (which I discovered by trying to cross only to be almost waist deep is a powerful current and decided discretion was the better part of valor for that day). The prudent choice was to remain at Locke Stream until tomorrow when the flood will presumably have dropped. 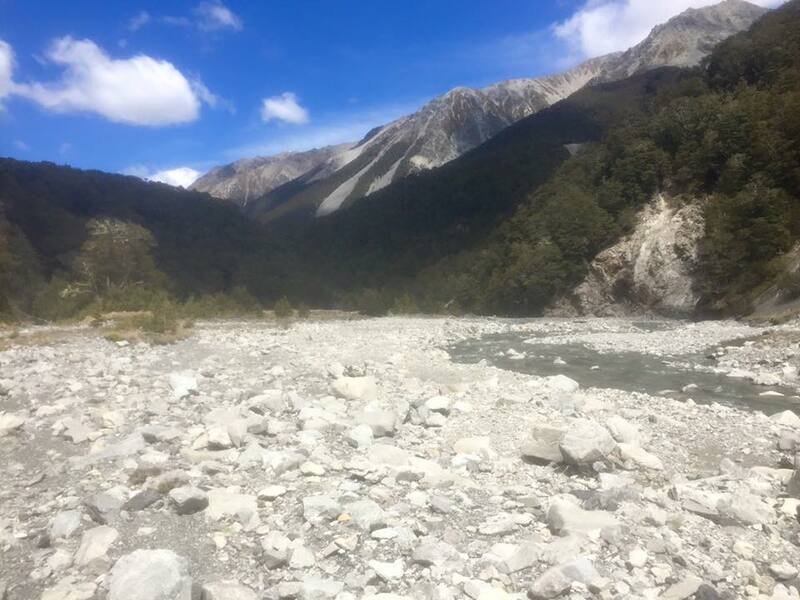 Will decide tomorrow but will likely take the road down the other valley to Arthur’s Pass as the books all say not to try the Deception/Mingha trail after heavy rains. The hike over the pass was actually pretty fun. Was soaked from the rain and lots of stream crossings, so I ended up splashing through the trail like a kid. There was one moment on the ascent where I rounded a muddy turn and was ready to step on a large rock on the side of the path only to realize just in time that it was not a rock but instead a bloated, hairless, dead cow. Glad I didn’t stab its side with my trekking pole for balance– the smell, whew. Locke Stream is one of the original huts built in the 1930s when they were trying to make the Harper Track a rival to Milford, an ill-considered idea as there is not a lot here that I would call arresting beauty. The hut itself is very cool. It is an isolated place so it was built from hand-hewn native timbers. The framing is all exposed and was clearly riven and the floorboards were adzed smooth. Spent a quiet afternoon getting caught up on my reading, etc. A cloudy drizzly day past a lake and up some river valleys. A couple of wet stream crossings, but rivers all had swinging bridges. Often the trail would go up into the woods for some serious mud and root hiking when there was dry open pasture land just down from it. All in all an uninteresting day’s walk. Alex and Courtney also went to this hut, so there was good company. At the hut when I got there were two kiwis and a Londoner who are doing the TA South Island. Hut was a little crowded, but still a pleasant evening. Ho hum.